This course offers thrilling rewards to shot makers who take chances, use proper course management, and welcome challenges. 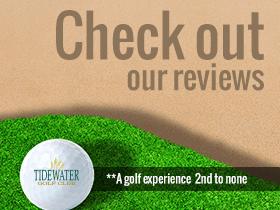 Welcome to Tidewater Golf Club – North Myrtle Beach Golf Courses. Nestled like a sleeping giant between the Intracoastal Waterway and Cherry Grove, the legendary Tidewater Golf Club offers the perfect combination of natural beauty and challenging play. Seamlessly marrying the game to its surroundings, architect Ken Tomlinson evokes the style and majesty of some of the game’s greatest venues and delivers an experience that puts this course on the must-play list of many Grand Strand golfers. When creating the design for Tidewater, Tomlinson visited some of the game’s greatest courses. Inspired by such legendary venues as Merion and Pine Valley, and respecting the time-honored tradition of crafting a layout that harmonizes with the landscape, he steadfastly refused to incorporate artificial elements and delivered a golf experience that can only come from this special place. The Tidewater community sits high atop a peninsula overlooking the Atlantic Ocean. 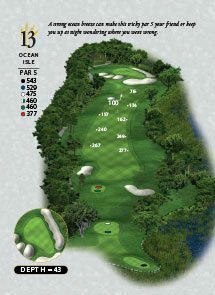 A magnificent saltwater marsh and ocean inlet adjoin the course on the east while the Intracoastal Waterway flanks several holes on the north and west. Adding to the visual variety, thick stands of hardwoods conjure memories of New England’s finest clubs. Expertly etching the course into this varied landscape, Tomlinson’s ambition was to create the exemplary qualities that would attract a national championship or Ryder Cup event. Flowing with the natural contours of the land, the course challenges you with a range of elevation changes not often found in seaside South Carolina. And as your round progresses, views of the Waterway, marsh and ocean bring fresh inspiration at every turn. With its classic yet contemporary design, the course offers thrilling rewards to shot makers who take chances, use proper course management, and welcome challenges. We are very honored to be the most awarded of all South Carolina and North Myrtle Beach Golf courses. We thank all our guest for visiting and playing golf with us. We are growing and now offering the best value and service for your next Myrtle Beach golf vacation packages. Come visit us at TidewaterGolfVacations.com or call (843) 420-1046 and speak to your golf concierge to insure the most memorable, worry-free and incredible golf vacation on your next visit to Myrtle Beach SC.